What is adult diabetes transition, Alex? Dr. Bekx received her medical degree from the Medical College of Wisconsin in Milwaukee and completed her pediatric residency at Ohio State University in Columbus, Ohio. She finished her training in pediatric endocrinology at the University of Wisconsin Children’s Hospital in Madison. 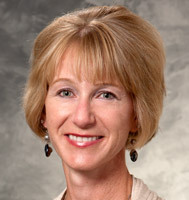 Dr. Bekx is board certified in pediatrics and pediatric endocrinology. Her medical interests include diabetes and the endocrine aspects of Down syndrome, and she also sees patients at the Pediatric Polycystic Ovarian Syndrome (PCOS) clinic.